I usually don't talk much about work here, but I couldn't think of a better place to note this. A few months ago I commented on the recognition that one gets from academic publishing; I just learned from a colleague that one of my articles (Le & Agnew, 2003) is the second most cited paper from the journal Personal Relationships between 2002-2013, and that among the PR papers published between 2010-11, another one of our papers (Le, Dove, Agnew, Korn, & Mutso, 2010) is the second most referenced in 2012. Wanna get cited? Do meta-analysis! Star Wars + Relationship Research + Facial Hair = Awesome. On the left is a screenshot from David Bromberg's Facebook page; I took a photo at his concert last night at the Colonial Theatre in Phoenixville, PA, and sent it to my friend Mark Cosgrove, the guitar/mandolin player in David's band. Mark asked me if they could post it on their Facebook page. I gladly agreed; I'm honored that they liked the photo. * In the first 5 hours, 165 strangers had "liked" the photograph, 18 people had "shared" my photo on their Facebook walls, and there were a number of very complementary comments. 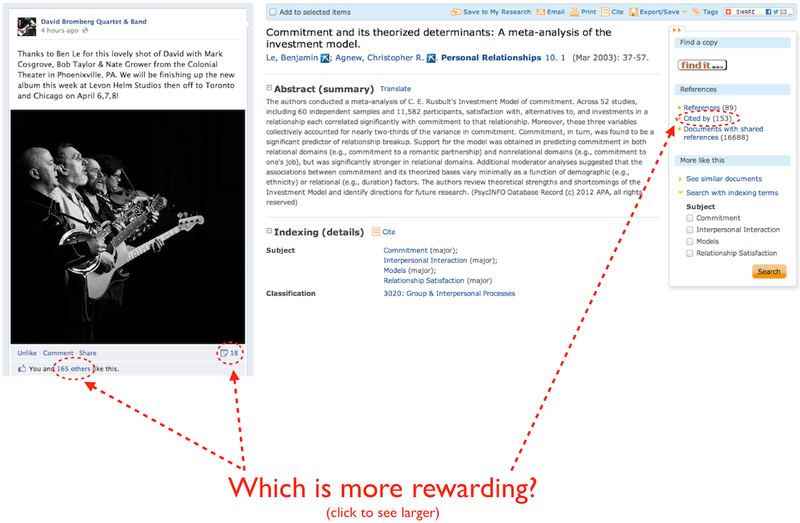 On the right is the PsycInfo information on my most well-cited article (Le & Agnew, 2003...Our Investment Model meta-analysis; PsycInfo is the primary database for psychology journal articles). This paper was published a decade ago (coincidentally, exactly 10 years ago this month), and to date has been cited 153 times. I haven't gone through to talley up how many of those citations came from (a) me (probably about 10-15 of those are me citing that paper in my newer work), (b) colleagues I have done research with (maybe another 40 of those citations? ), or (c) researchers in my field that I know personally (another 40 of those?). My guess is that there are about 50-60 people in the world who have stumbled upon that paper in their own research, without knowing me, and decided they like that paper enough to cite it in their own work. Update #1: In the time it took me to write this post, 7 more strangers liked my photo, but, to my knowledge, no new papers citing my article were added to PsycInfo. Update #2: After a couple of days, the photo has been shared around 35 times and liked over 345 times (as far as I can see). My response to "Why Should Professors Not Be Accountable?"